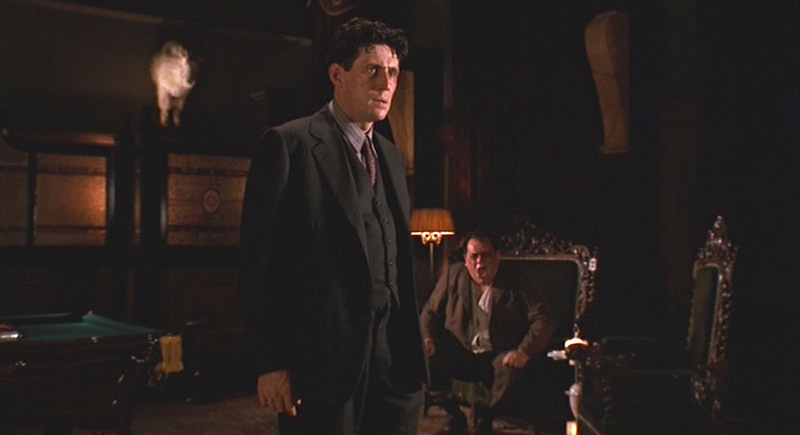 Miller’s Crossing is one of my favorite Coen Brothers movies as well as one of my favorite crime films. Perhaps overshadowed the year it was released by higher pedigree mob flicks like Goodfellas and, uh, The Godfather Part III, the Coens’ neo-noir black comedy has gained a cult following in the years since for its spirited tribute to the works of Dashiell Hammett, particularly Red Harvest (1929) and The Glass Key (1931). 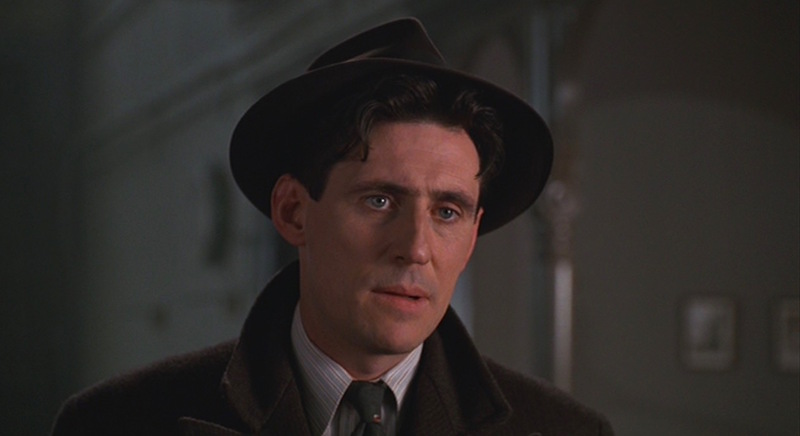 The central mover-and-shaker in Miller’s Crossing is Tom Reagan, a slick Irish mob fixer whose influence comes from his subtlety. 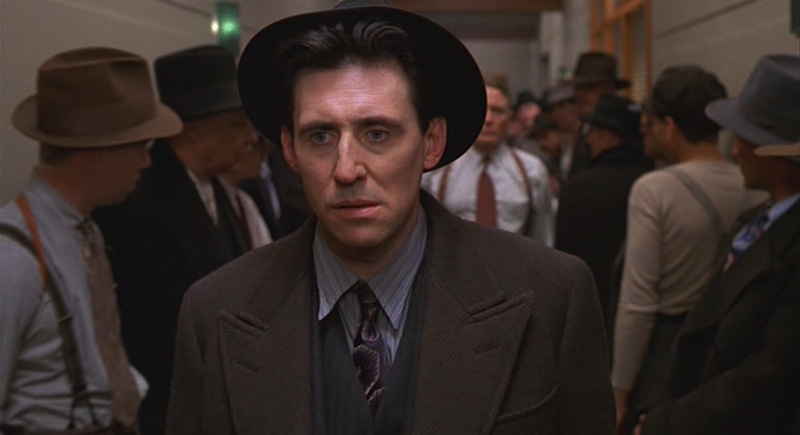 Unlike the two reigning mob bosses in the unnamed Prohibition-era town, Tom has no ambitions to be sitting in the top spot, but it is his machinations that drive the plot as he works each side against the other, a classic narrative structure also found in Yojimbo (1961), A Fistul of Dollars (1964), and Last Man Standing (1996). 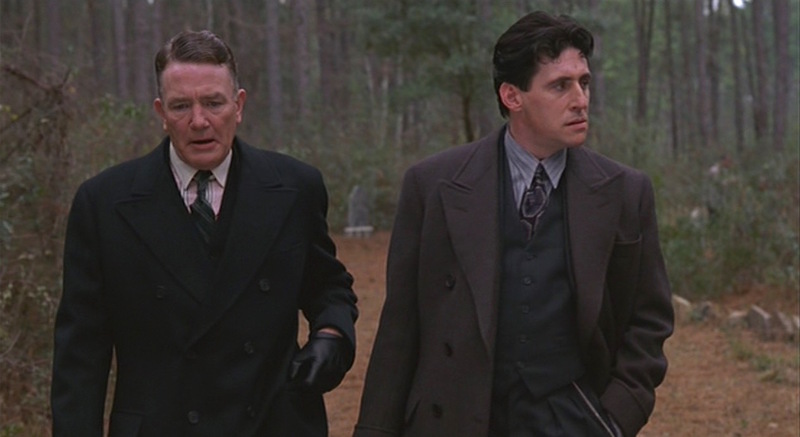 Tom Reagan wears two warm suits in Miller’s Crossing, both appropriate to the era as well as the climate in what appears to be a northeast American small town in late fall. 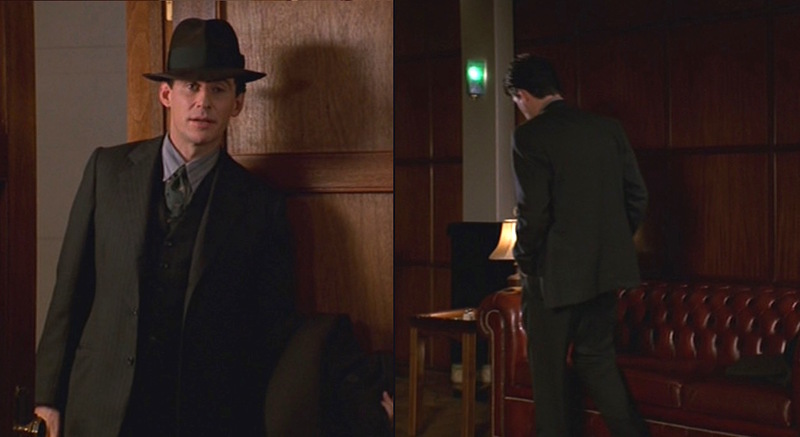 The suit that gets the most screen time is a charcoal striped flannel three-piece suit. Tom’s sense of sartorialism is certainly greater than that of the schlubby screaming pugilist seated behind him. The single-breasted suit jacket has notch lapels – with a buttonhole through the left lapel – that roll to a two-button front. In addition to the welted breast pocket, Tom’s suit jacket has straight jetted hip pockets that may have flaps which are tucked into the pockets. The back is ventless. The straight shoulders are roped at the sleeveheads, and each sleeve ends with three buttons on the cuff. Tom wears his matching suit vest with all five buttons fastened, even the lowest button over the notched bottom. The vest has two lower welted pockets. By the late 1920s, it was typically customary to wear the lowest waistcoat button unfastened to avoid bunching at the bottom… Tom didn’t get the memo. Unlike most suits featured on this blog, we get much better looks at the trousers than the jacket as Tom has a tendency for not wearing the suit’s jacket and waistcoat without sporting his overcoat as well. The only back pocket is a jetted right-side pocket that closes through a button, and each side pocket is open along the side seams. When fully dressed, Tom wears his keys in the left-side pocket with a long silver chain. The back of the trousers is split with a small fishmouth notch that divides each inner button that connects to his suspenders. About an inch or so below that is a cinch adjuster loop with a buckle, a period detail found on many suits of the 1920s. The bottoms are finished with cuffs. Tom kicks back in his trousers at home. 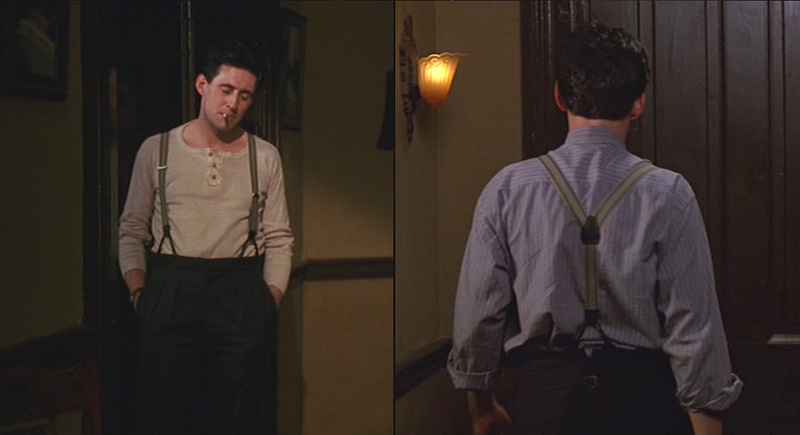 Tom’s suspenders (aka braces) are tan fabric with olive brown stripes; there is a thick stripe near each edge of the suspenders with two thinner broken stripes between them. They have silver metal sliding adjusters in the front and a black leather back patch that matches the black leather double ear tabs that connect to the buttons along the front and back of his inner trouser waistband. Tom has a habit of lounging around his apartment in his suit trousers and undershirt, a beige cotton long-sleeve henley with a three-button placket and a wide, reinforced crew-neck collar. The henley shirt is oversized with his shoulder seams falling off the shoulders to well down his biceps. 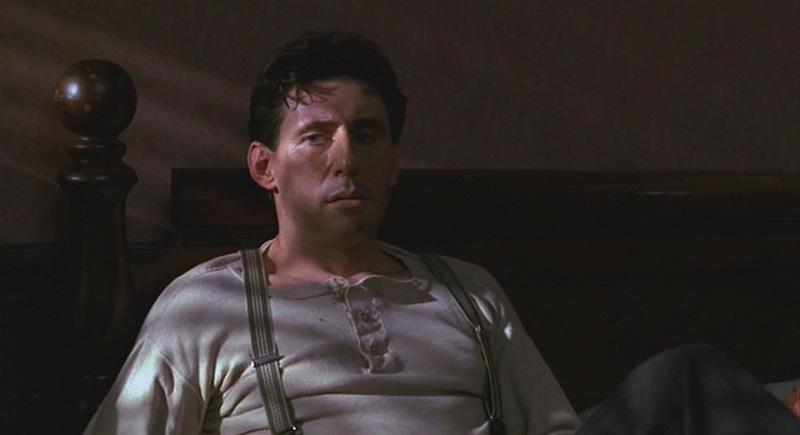 One of many lonely nights with only an endless supply of cigarettes and a striped pair of suspenders to keep Tom company. Tom has a clear preference for lighter blue striped shirts, wearing a few with this suit and one that alternates with other more colorful shirts with his taupe tweed suit. His main shirt, worn in many scenes – including Tom’s first appearance – consists of tonal blue stripes against a periwinkle ground. It has a point collar, squared button cuffs, and a breast pocket. The opening scene also features Tom’s first tie, a green silk tie with scattered yellow ovals split in the center with a short red line. Tom takes the first of many – and I mean many – swallows of whiskey. 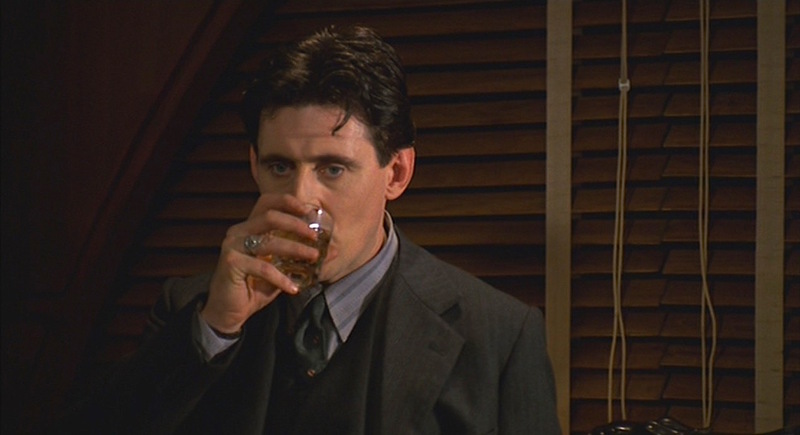 Tom’s other shirt, which makes a brief appearance with his first tie and is worn again during the final scene at Bernie’s funeral, is periwinkle striped cotton like the other shirt but with light blue stripes bisected by a muted red stripe. As opposed to the all-blue striped shirt, this one has a muted red stripe. The second tie that Tom wears with this suit – when he is getting beat up by Leo and again for Bernie’s funeral – is deco-patterned silk with a pattern resembling indigo-colored amoebic floral bursts with white borders on a dark purple ground. Tom’s “amoeba tie” is best seen just before Leo gives him the kiss-off. Returning to the nightclub later (even though he’s persona non grata), Tom wears a more conventional foulard tie with alternating navy and olive cross-checked boxes, all with red dots in the center. 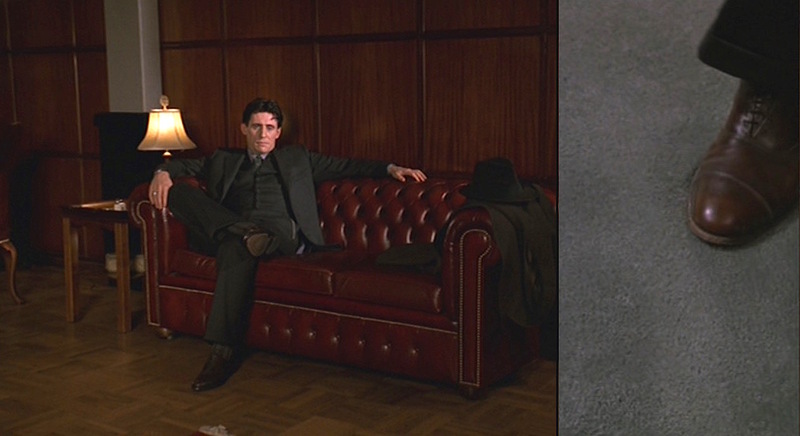 Finally, when Tom confronts Bernie in his apartment hallway toward the end, he wears a duo-toned tie comprised of an interlocking pattern of orange shapes connected by a red grid that zig-zags down the tie. 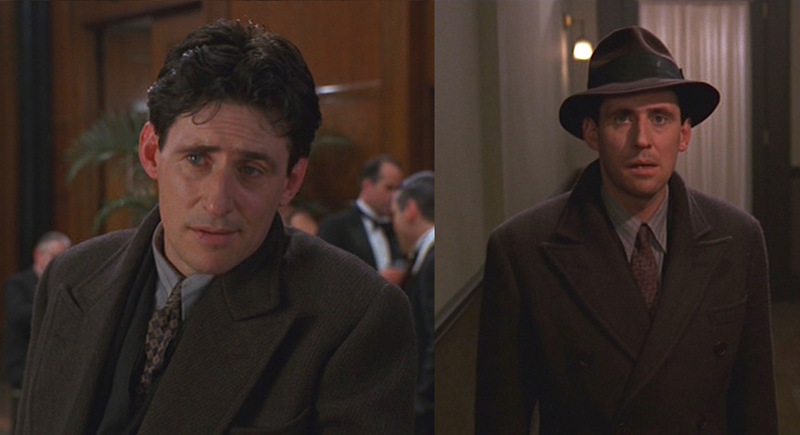 Tom sports some colorfully patterned ties through the latter half of Miller’s Crossing. Tom wears a pair of dark brown leather cap-toe oxfords with gray striped dress socks that nicely continue the color and pattern of the trouser down the leg line and into his shoes. Tom kicks back in Leo’s office. 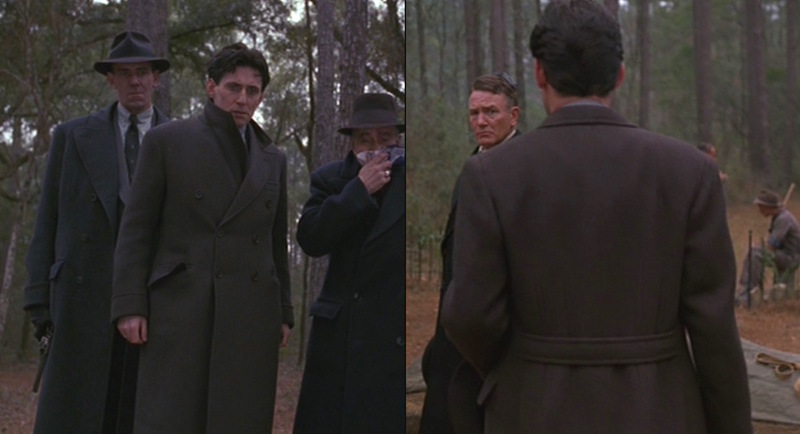 Tom spends much of the film wearing a knee-length double-breasted overcoat in brown twilled flannel. The coat has wide peak lapels, detailed with swelled edges, felt under the collar, and a buttonhole through each lapel. It has a six-button (two to close) front, padded shoulders, turned-back gauntlet cuffs with no buttons, and a belted back over the single vent. Tom’s coat has a welted breast pocket and straight flapped hip pockets. When surrounded by so many disappointing faces in the middle of the woods, Tom is always wise to be on his guard. 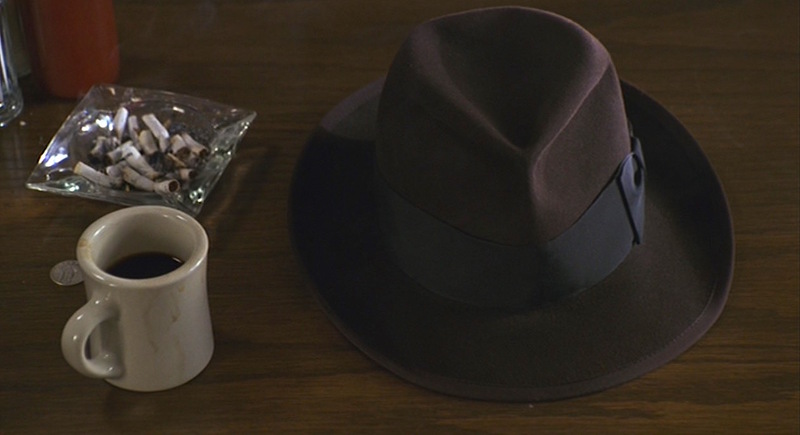 “There’s nothing more foolish than a man chasing after his own hat,” Tom concludes after recalling his recurring dream, and yet who is Tom Reagan without his trusty fedora? Tom’s felt hat is a rich dark brown, like his coat, with a pinched crown, wide black grosgrain band, and brown grosgrain edges. The life of a noir hero. 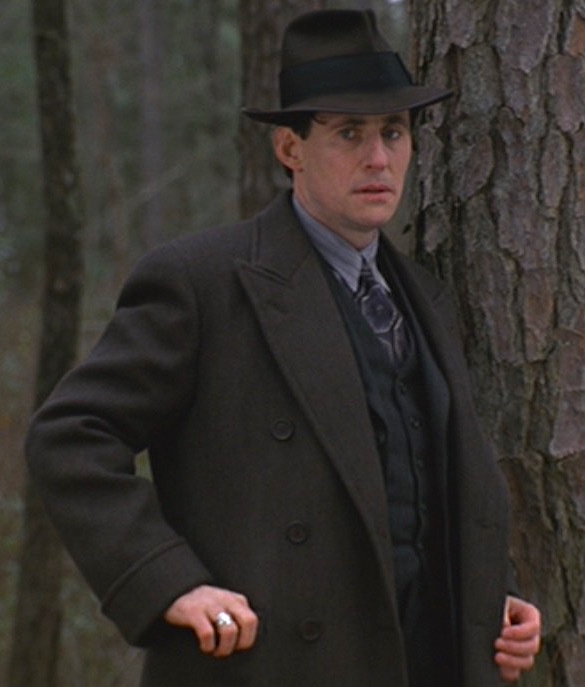 Tom wears an ornately engraved silver ring throughout the film, although – unlike many movie gangsters – he opts to wear it on the third finger of his right hand rather than his pinky. Further up his right arm, he wears a round-cased steel wristwatch with an off-white dial on a black leather strap. Tom wears both his ring and watch on his right hand. When receiving late night visitors, Tom has the decency to cover up his big, dirty undershirt by slipping into a luxurious navy blue printed paisley silk dressing gown with shawl lapels and turnback cuffs both faced in solid navy satin. Tom lounges comfortably around his house. 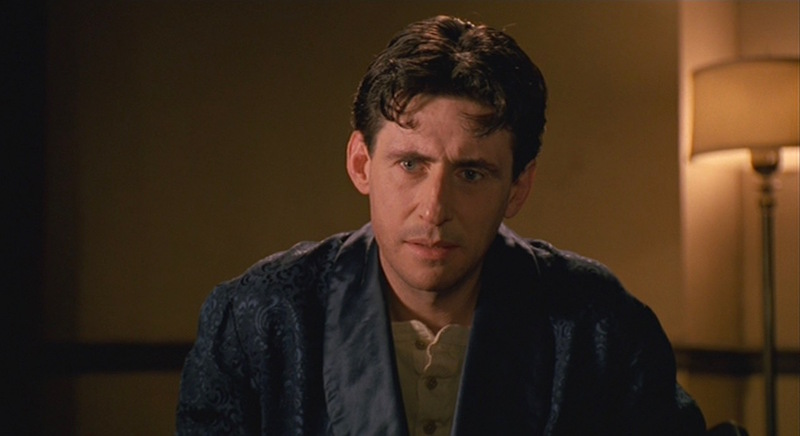 There may be some significance in the fact that the pragmatic, rational Tom wears a cool-tinted blue robe compared to the fiery red robe worn by the hot-blooded, impulsive Leo… right? Tom dresses practically and warmly for his profession and setting, but his ties especially allow for some subtle creativity. 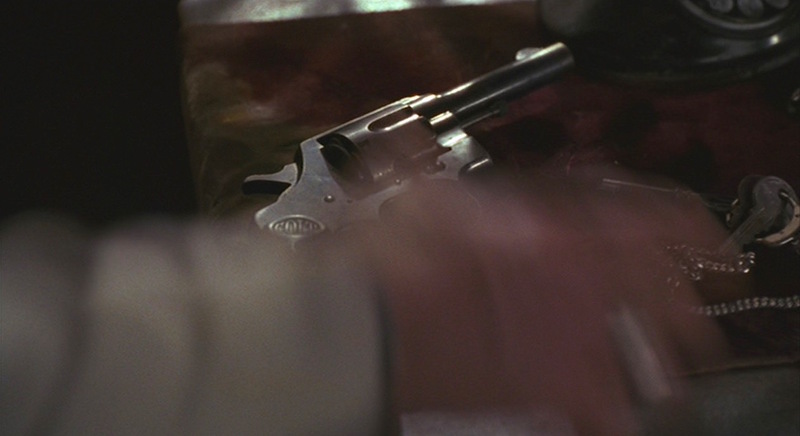 I’ve seen it identified as both an Official Police and a Police Positive, but I believe that Tom’s bedside Colt revolver is actually a .32-caliber Colt Pocket Positive, similar to the one later seen in the hands of Verna Birnbaum (and possibly intended to be the same gun.) 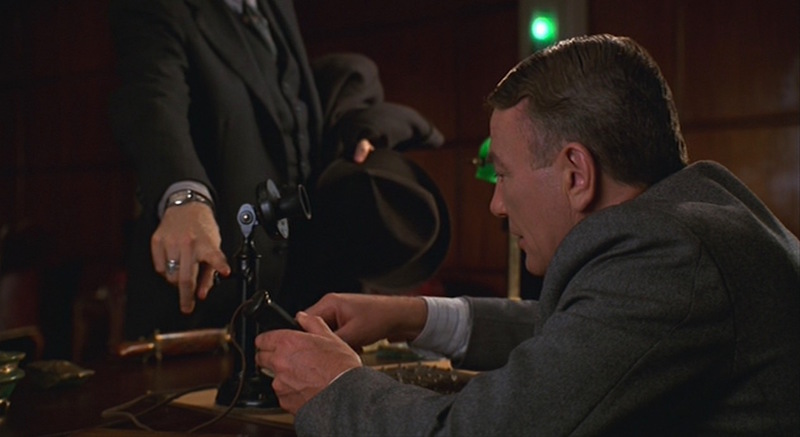 The Pocket Positive is a practical choice for Tom, who would favor functionality over flash despite the many interesting and lesser-seen period firearms in Miller’s Crossing like the Astra 400 and CZ-27 pistols. Tom quickly grabs his Colt after Bernie Birnbaum returns to life. Note the key chain next to it; this is typically worn on his trousers with the keys tucked into his left side pocket. Introduced in 1905 as an evolution of the Colt New Police, the Colt Pocket Positive was also a favored sidearm of J. Edgar Hoover. Hoover was presented with his nickel-plated .32 New Police model with its two-inch “snub nose” barrel in 1938, two years before Colt ended production of the Pocket Positive. Hoover would keep his revolver – serial #157299 – in his desk drawer for much of the career, an unsecured place for a firearm but decidedly safer than out on his nightstand. Is there a point… or are you just brushin’ up on your small talk?